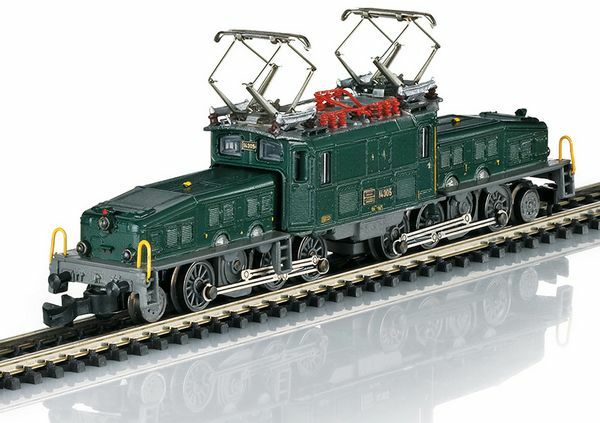 Marklin 88564 Crocodile Class Ce 6-8 III Electric Locomotive Prototype: SBB Historic class Ce 6/8 III, road number 14305. The locomotive looks as it did after 2017. Model: The model has a motor with a bell-shaped armature and LED lighting with Swiss headlight / marker light code. The catenary selector screw is mounted inside the locomotive. The locomotive has a new road number, 14305. It is finely painted and lettered. Both trucks powered. Length over the buffers 91 mm / 3-9/16". The locomotive is packaged in a high-quality real wooden case. A metal replica of the builder's plate and a booklet about the history of the locomotive are also included. Delivered in a real wooden case. A booklet about the locomotive included. A metal replica of the builder's plate included. SBB Ce 6/8 III – "Crocodile" The takeover by the Swiss Federal Railways (SBB) of the Gotthard line in 1909 brought radical changes. The most important new thing was the electrification of the Gotthard line now pursued with the highest priority, which included the start of electric operation on the actual ramps from Erstfeld to Biasca as well as the Gotthard tunnel on December 12, 1920. Finally, the line could be run continuously with electric locomotives from Lucerne to Chiasso starting May 28, 1922. The SBB required a large quantity of new locomotives for this purpose – and with the so-called "Crocodile" was born "the" Gotthard locomotive for freight trains. Initially, 33 units were delivered between 1919 and 1922 as Ce 6/8 II 14251-14283. Two groups of driving wheels, each with three powered axles and a pilot truck were linked by a close coupling. 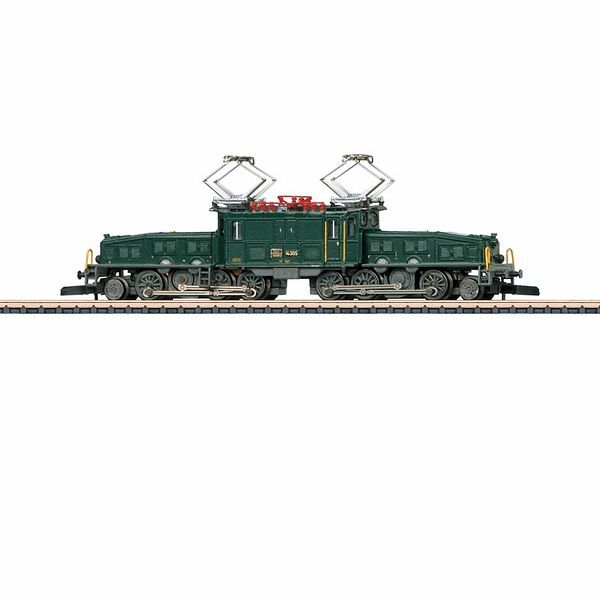 A short locomotive body was enthroned between the two groups of driving wheels thus guaranteeing marvelous maneuverability through curves. Constantly increasing performance in freight service caused the SBB to purchase 18 more Crocodiles in 1926/27 as Ce 6/8 III 14301-14318. They featured higher performance with 1,809 instead of 1,647 kilowatts / 2,426 instead of 2,209 horsepower. Their drive with two traction motors per group of driving wheels had been changed a little from their predecessors and was now done by means of the so-called Winterthur diagonal rod drive with the help of a counter jackshaft. Together with their older siblings, they dominated heavy freight service on the Gotthard in the following decades. In the mid-Fifties their maximum speed was increased from 65 to 75 km/h / 41 to 47 mph and they were thus re-designated logically as Be 6/8 III 13301-13318. The end of their use on the Gotthard did not come until the baptism of the Ae 6/6 at the end of the Fifties. All of the units initially went from the Erstfeld Depot to the Basle Depot and from there to other base locations. The "Crocodiles" now made almost all of Switzerland "unsafe" pulling freight trains. At the end of their career, they were only allowed to pull lightweight less-than-carload-lot trains. The last Ce 6/8 III disappeared from the rails in April of 1977. However, two units remain preserved with the road numbers 13302 (MEC Horgen) and 13305 (SBB Historic).